In a world where collective hives are enslaving the population and individuals have been hunted to the verge of extinction, Maggie Harper, an independent 21st Century woman, must find the strength to preserve the freedom of the future, but without the aid of her memories. 2. 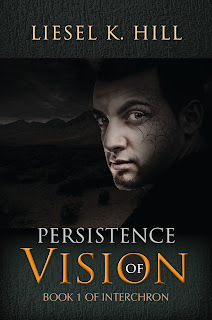 What inspired you to write Persistence of Vision? Two things. The very first part of the first chapter--where Maggie has a time-loss episode in Vegas--is actually a true story. My sister's co-worker had that exact thing happen to her and her husband. They were sure it was a tourist trap that had to do with not watching their mixed drinks be made. (Crazy scary, huh?) Anyway, my sister told me the story and my imagination just kind of went, "Huh. Well, what if..." Even after figuring out the main Maggie story line, I still felt like the story as a whole was incomplete. It needed another major element to off-set the first. My final semester in college I took a 'Literary Science Fiction' course. It was really fascinating. Most scifi (at least the literary stuff) has an agenda, and many of the pieces I read I actually didn't like because they had political agendas I didn't agree with. That said, I did like a few of them. And when I liked one, I really liked it and it set my imagination afire. I became obsessed with thinking about the exact moment in time when a choice is made. What happens when someone who has been making really bad choices for so long suddenly decides to make a good one? What happens on a physical level? A psychological level? An emotional level? A human level? From that, David's story was born. 3. I noticed that the cover model is one of the "tattooed assassins". Is there a reason you chose to feature one of them on the cover instead of Maggie or Marcus (two of the main characters)? No particular reason other than that it was a cool image. I wanted the cover to be dark and broody, and I told the art department at Tate Publishing about my creepy-looking assassins and they thought it would make a great cover image. I really thought it would only be one part of the image, rather than the entire thing, but I LOVE the way it turned out. It's so evocative. The only (somewhat) negative thing is that they made him kind of cute. I've had so many people (and by people, I mean women) look at the cover and go, "Ooh, he's cute!" I have to explain to them that he's the bad guy and not the kind of person you'd want to spend an evening with. Now ladies, stop lusting after him and start focusing on Marcus. Or maybe David. :D In all seriousness, though, I couldn't be happier with the way the cover turned out. 5. What is the best thing that has happened to you since becoming an author? OR What is the best thing about being an author? The best thing by far is getting a book picked up by a publisher! :D The best thing about being an author is the instant credibility. People find out you're writing a book and they immediately thing you're the Great and Powerful Oz and are willing to tell you anything. I dare you to try it. Start a conversation with "Hi there. I'm writing a book and I was wondering..." People will open right up to you, which is great as I've never been a particularly social person. 6. If you could be any paranormal creature what would you be and why? 7. What is the weirdest thing you have used as a bookmark? Probably food. I have a bad habit of snacking while reading. (I have to not do this with borrowed books because I end up getting stuff on the pages--and by stuff, I mean chocolate.) I've been known to set a bowl down on an open book to hold my place, or wrap up a half eaten granola bar and stick it between the pages. Needless to say, you can always tell which book is mine! 9. Rain or Sunshine? Definitely rain. 11. E-Book or Physical? Either, depending on the situation. Thank you so much Liesel for joining me on the blog to do a super fun interview! I really enjoyed your answers and just FYI you are totally not borrowing books from me with those food bookmark habits LMAO. If you highly enjoyed this interview and spotlight as much as I have please feel free to leave some nice comments for Liesel below and make sure to click the links above to check out her and her novel. I think your publisher did a great job with the cover art.